Baumgarten, Alan, 1957- editor of moving image work. Brandon, Maryann, editor of moving image work. Kravitz, Zoë, 1988- voice actor. Libatique, Matthew, 1969- director of photography. Lord, Phil, 1977- screenwriter, film producer. Miller, Chris, 1975- film producer. Pine, Chris, 1980- voice actor. Rothman, Rodney, film director, screenwriter. Ty Dolla $ign, 1985- performer. Vélez, Luna, 1964- voice actor. Spider-man. Into the spider-verse / Columbia Pictures presents in association with Marvel ; an Avi Arad/Lord Miller/Pascal Pictures production ; a Sony Pictures Animation film ; produced by Avi Arad, Amy Pascal, Phil Lord, Christopher Miller, Christina Steinberg ; story by Phil Lord ; screenplay by Phil Lord, Rodney Rothman ; directed by Bob Persichetti, Peter Ramsey, Rodney Rothman. 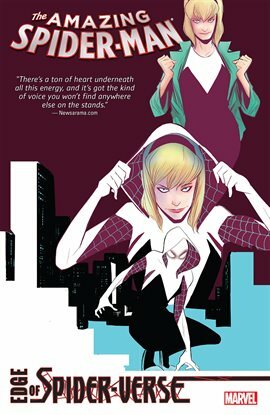 Spider-man into the spider-verse : the official guide / written by Shari Last. 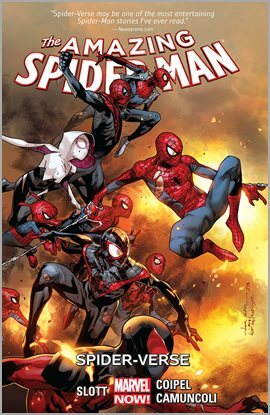 Spider-Man into the spider-verse : the junior novel / adapted by Steve Behling. Spider-Man, into the Spider-Verse [sound recording] : (soundtrack from & inspired by the motion picture). Spider-Man : Spider-verse : Spider-Men / written by Brian Michael Bendis, David Hine, Fabrice Sapolsky, Gerard Way, Tom DeFalco and Tom Peyer; and illustrated by Sara Pichelli, Richard Isanove, Jake Wyatt, Jacob Chabot and Agnes Garbowska.